No one wants to believe the worst when 85,000 kids are at stake. But really, “have your voice herd” and breath vs. breathe? – Your $40,000 and Ray and Associates provided these errors. See the entire application for yourself. UPDATE – it’s been revealed that Ray and Associates was responsible for the preparation of this document (but they are McMinimee’s words.) So, the $40,000 you paid as taxpayers was given to a professional company to prepare these packages for the Board to review. So, Ray and Associates is responsible for the misspellings, punctuation errors, and bad grammar – McMinimee is responsible for the content. Is this really the best we can do for 85,000 kids? The largest school district in Colorado? Dear Jeffco Board of Education: Really??? I submitted a CORA request so that we could all see what Mr. McMinimee’s qualifications are considering he will be our next superintendent (since no other finalists were presented!). Similarly, I also submitted the request because I wanted to see what data Mr. Witt must’ve been privy to in order to make the statement quoted in the Denver Post, “Daniel is someone who has a strong record of academic achievement.” I asked Mr. McMinimee for data to substantiate this statement when I met him at the meet & greet on the 15th – didn’t get even one statistic or test score or data point. Knowing that data is what drives Mr. Witt’s decision-making (learned via the full-day Kindergarten budget discussion among others), I thought surely I would receive data via my CORA request. See for yourself. Attached is Mr. McMinimee’s candidate file from Ray & Associates – contains the candidate report where he answers the board’s questions, a background check, reference summary, letter of interest in the position, his application, and his resume/CV. I tell you what – the number of spelling & grammar mistakes where McMinimee answers board questions – that would’ve sent him to the bottom of the pile for me – pet peeve. He says, “have their voice herd” at one point – hmmm – maybe that wasn’t a typo?! Seriously – just sloppy – maybe it was so because he turned in his packet on the last and final day – April 25th?! 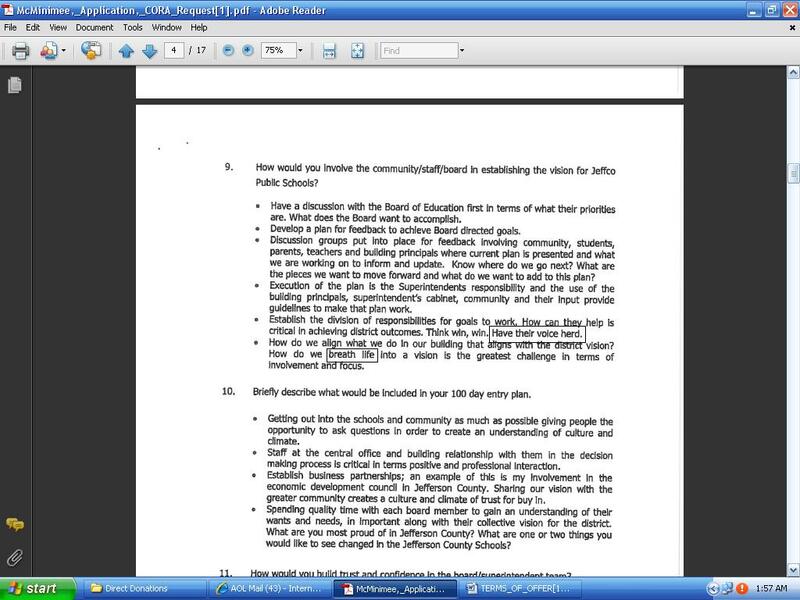 By the way – on page 4, question 11, bullet 3, Mr. McMinimee answers the question of “how would you build trust and confidence in the board/superintendent team?” by saying, “provide data in support of decision making. Answer questions based on homework.” k, Mr. McMinimee and Mr. Witt – here’s a golden opportunity to start to repair this broken trust & confidence – show us the data to support the decision that Mr. McMinimee is the best candidate to be our next superintendent! #12 on page 5 is an interesting one to see Mr. McMinimee answer. Note that the question asks him to “describe your direct experience in narrowing any academic achievement gaps that you have encountered during your career.” He doesn’t answer the question! He postulates on what he would do – not what he has done!! #15 on page 6 – “Led change in HS scheduling resulting in increased opportunities for students, lower class size and high achievement on multiple indicators and increased participation in programming.” I think this article sheds some light on this scheduling change – seems to me that if this worked well, you wouldn’t see 4 high schools bailing on this option at the 1st opportunity! Btw, congrats to Mr. McMinimee – wow – this will be a $100,000 raise for him – and he doesn’t even have a superintendent’s license! For your convenience, here are board member & media emails – I encourage you to read through this information yourself – it will help to guide your questions as the board moves forward with their decision.